Wales prop Samson Lee has said he is proud of his Traveller background and what he has achieved for his community. 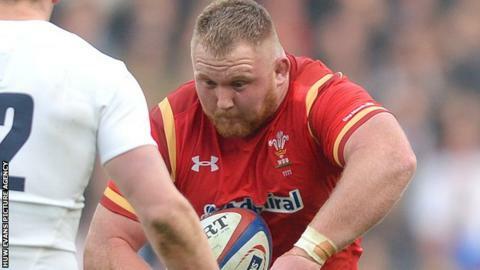 The Wales prop, 23, was called "Gypsy boy" by opponent Joe Marler during Wales' defeat by England on 12 March. Marler has escaped punishment but World Rugby has asked for an explanation. "I believe I am the first international rugby player with a Traveller background," Lee said in an interview, published on Saturday, which was given before the Marler incident. "I'm very proud of who I am and what I have managed to achieve on behalf of Travellers." The comments are in a Welsh language article, written by BBC Wales rugby correspondent Gareth Charles, which has appeared in the match programme for Saturday's Six Nations match between Wales and Italy. In the interview, Scarlets player Lee speaks of his pride at representing his community in international sport and talks fondly of the support his extended family have offered during his career. "I have a close family with more than 60 cousins," he said. "More than 20 of them come to see me when I play for the Scarlets or in home matches for Wales and some of the youngsters now are beginning to take more interest in rugby than boxing."